There&apos;s something special about getting dressed up and going out to see a show. 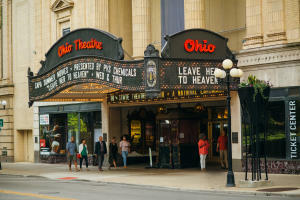 In Columbus&apos; Theater District, there are four large theaters, The Palace, The Ohio, The Southern and The Lincoln, and three smaller spaces bringing you everything from ballet and opera to avant garde plays. The Wexner Center for the Arts puts on frequent dance, theater and music performances that bring in artists from around the world. During the summer months, the Columbus Symphony brings outdoor concerts to downtown&apos;s Columbus Commons for its popular Picnic with the Pops series. The Brewery District&apos;s Shadowbox Live! is America&apos;s largest resident theater company, and performances range from the comedic to the artsy. For a night out in Columbus, I love starting with dinner at Sidebar to enjoy fabulous cocktails and flavored food. Then I&apos;ll end up seeing a show either at the Southern Theatre or the Ohio Theatre.